Workplace accidents or incidents are a common occurrence and Iowa CTS Cleaners is here to professionally recover any work place accident or incident with care and understanding. Whether your work place has just experienced a tragic employee accident or worse- work place violence due to a crime scene shooting or employee injury or death, Iowa CTS Cleaners can help. 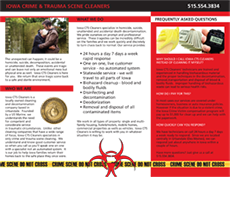 We are your Statewide crime and death scene professional service with decades of experience in crime scene, blood and biohazard cleanup involving the work place. 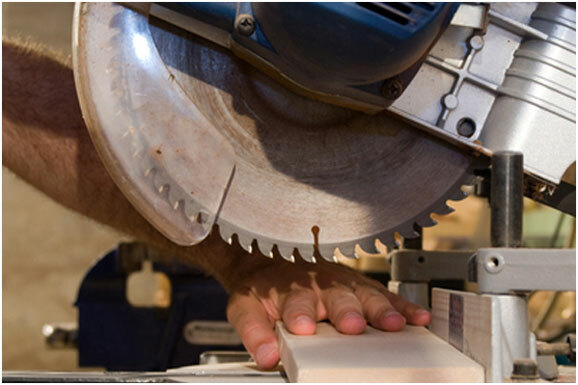 Iowa CTS Cleaners has experience removing blood scenes from work places such as; convenient stores, machine shops, assembly factories, restaurants, office buildings, and many others. No work place accident is ever the same and having multiple years cleaning and decontaminating biohazards from the work place makes our teams fully qualified to handle any situation. Iowa CTS Cleaners is prepared to handle any industrial accident, workplace incident involving blood, tissues, body fluids that require biohazard cleanup at a work site. Let Iowa CTS Cleaners eliminate bloodborne pathogen hazards at your workplace, as well as any OSHA liability regarding improper employee cleanup of biohazards. Beware of NON-local accident cleanup services. Due to internet advertising many biohazard cleanup companies try to pass themselves off as local when they are NOT! Hire local, hire Iowa CTS Cleaners! Iowa CTS Cleaners has all required OSHA protective equipment needed to recover an incident at a job site.